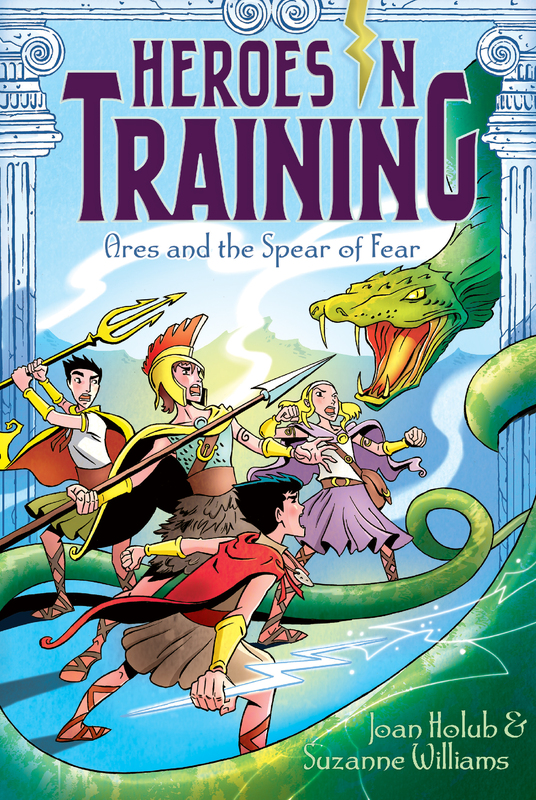 Ares, Zeus, and the other Olympians encounter a huge snake and a sharp challenge in this Heroes in Training adventure. After overcoming many challenges, Zeus and his fellow Olympians arrive at the temple at Delphi—only to find a giant snake guarding the entrance! Beyond the python, Pythia appears. Trapped in the temple by the python’s magic and mere presence, Pythia urges the Olympians not to worry about her, for they are urgently needed on another quest. Scrubby plants brushed against Zeus’s legs as he raced across the top of the mountain. Behind him, he could hear the grunts of the half-giant Cronies as they chased him and the other Olympians across the sandy ground. Zeus risked a quick look behind him. The size and bulk of the Cronies, plus the armored chest plates they wore, were slowing the half-giants down. Hera and Poseidon were right behind Zeus, with Apollo behind them and Ares bringing up the rear. There should have been three more Olympians with them, but the Crony army had captured Hestia, Demeter, and Hades. Zeus tried not to think about that now. He couldn’t save anybody if the Cronies captured him, too. “We should stand and fight!” Ares yelled. Zeus tripped over a rock and fell facedown onto the ground. Before he could get back to his feet, he felt a hand grip each of his arms. Hera and Poseidon had grabbed him. They pulled him up. These two Olympians—along with Hades, Hestia, and Demeter—were Zeus’s brothers and sisters. (Although, they had only just found this out.) Even though Apollo wasn’t their brother, he had joined the group like he was one of them too. His singing rhymes were both funny and kind of annoying! “Nice move, Bolt Breath!” Hera teased. “I didn’t see it!” Zeus protested. “Um, guys—still running!” Poseidon called back, jogging ahead of them. Apollo caught up to them. “I see some trees up on the right. If we hide there we’ll be out of sight,” sang the blond-haired boy. “How can you rhyme at a time like this?” Hera asked, rolling her blue eyes. “Hiding in the trees is a good idea. Let’s go!” Zeus cried. They veered toward the right and headed into the stand of trees. Zeus came to a stop, panting. “We need Pythia,” Poseidon said, frowning. The Oracle of Delphi always showed up to tell them what to do next. But after they’d found Ares, she hadn’t appeared. “That’s why we’ve got to lose these half-giants and get to Delphi,” Zeus told him. Apollo, Poseidon, and Zeus all scrambled to hide behind trees too. But not Ares. He raised his spear and charged through the trees, screaming so loudly that the sound echoed through the hills. He was. Zeus thought Ares looked pretty ferocious as he sped through the trees with his sharp spear, spiky brown hair, and weird, fiery eyes. But Zeus knew that Ares didn’t stand a chance against the Cronies on his own. He darted out from behind the tree. Zeus, Hera, Poseidon, and Apollo raced after Ares. They found him standing just outside the trees, frozen in fear as he stared at the approaching Cronies. Zeus couldn’t blame him. Each Crony was about eight feet tall and massively muscled. They brandished clubs, spears, and sharp arrows. “Wh-what plan?” Ares asked, his bottom lip trembling. The chase began again. The Olympians raced off along the edge of the mountain ridge. Somewhere down below, Zeus knew, was the rest of King Cronus’s army. “You can’t escape us, Olympians!” one of the Cronies bellowed. Zeus saw Ares turn pale as he ran by his side. Ares can talk a good talk, Zeus thought. But can he back it up? The Olympians quickly gained another lead on the Cronies. But then Poseidon came to a quick halt up ahead of Zeus. “Hold on, guys!” Poseidon yelled. Zeus suddenly realized why Poseidon had stopped. The Cronies had chased them to a dead end—a narrow ledge overlooking the canyon. Zeus ran to the edge and looked over. The canyon wall was too steep to climb down, and too high to jump from. Deep, rocky craters and sharp boulders dotted the landscape below. Hera, Apollo, and Ares arrived next, panting. “We’re done for!” Ares wailed, looking down. “Yup, sure seems that way,” Hera agreed. The five of them turned to face the Cronies. One of them had a big scar across his face. “We’ve got you now!” he growled.